Your green industry business could have the best service in the world, but without digital marketing, you won’t have the best business. Marketing brings in new customers that keep your company thriving. 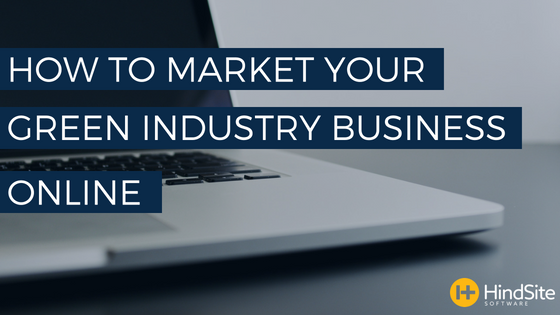 Marketing can be done in numerous traditional ways; including email blasts, flyers, and merchandise, but it can also be done in some unique ways online. Read on for the inspiration you need to give your business a digital boost. In a world with over 1.8 BILLION websites, make yours stand out. A web designer can help take your green industry business website up a notch and keep it within branding standards. Before you think you don’t have the room in your budget, listen to this: according to Entrepreneur, over 20 million shoppers are now online comparing brands, prices, and products. 93% of shopping decisions are made online, according to Mashable Business. That being said, if you don’t have a website, you are losing business to other companies. As Entrepreneur states, make sure that your website is reflects positively on your business. Create a website that is clean, accurate, and easy to navigate to ensure visibility for your product. SEO is crucial when you’re creating a website and once it’s live. This is how you drive traffic and, depending on what tools you use, it won’t cost you a whole lot. The first step in developing a local SEO strategy is to determine where you currently stand and how you stack up against your competitors. To figure that out, start listing out all the possible long tail keywords for your area. So you can combine the services you provide and the territory you work in. Once you’ve identified a larger list of keywords that could be a good fit for your customer base, start whittling them down to your top ten based on how much traffic they’ll bring to your site. Figure out which keywords should be easy to rank for, for instance “lawn maintenance in Maplewood” would be a great one if you are a lawn maintenance business in the east metro of Minneapolis/St. Paul. When you have that keyword identified, you can then create targeted content around it. You could create a webpage that talks about irrigation services in your area, or a testimonial page from customers or create content, like a blog post or video, about local water management goals for whatever city your business is located. When establishing your brand, think to the future. Make sure your brand has a consistent logo and color theme that can be replicated for years to come. Make sure the logo and slogan you have on your truck matches the logo on the yard signs and uniforms. Keep your branding consistent throughout your social media presence. All of this effort will make an impact by making your company easy to remember. Now that the green industry is getting more active online, keeping your own business noticeable online is an art form. It requires constant attention—and yes, is worth every bit of effort. For the best results, create a Facebook and Twitter page and update both at least three times weekly. Also, make your websites visible by giving them custom URL’s. There is no better place to promote your business than on social media, which is continuing to grow more popular every day.